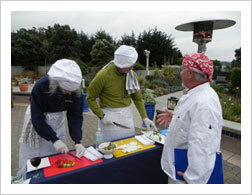 Food and culinary team building is such a great way for your teams to achieve some great teambonding! TeamBuilding Unlimited and Murder on the Menu have created great culinary team building events over the years, and now we've added even more culinary events to our "menu." Here at TeamBuilding Unlimited we're always pushing the envelope to develop new and creative team building events and activities for our clients. Check back often for our latest culinary capers and events! This is not just Icing on the Cake... Teams design and decorate cakes to reflect their team, their company, their goals and objectives. (Themes for cakes will be decided in consultation with the company). Each person will be given an apron and a chef's hat. Individuals will decorate their chef's hat with their team name. Then the real fun begins. Each team is challenged to create and decorate a cake that symbolizes the team itself, the company, their positions at the company, or another theme. Each group will be given a large sheet cake that can be carved or left as is. With a variety of cake design supplies, tools and assorted cake decorations, the group will turn their concept into reality. After the cake is designed and decorated, each team will create a commercial to present their cake to the entire group. And last but not least, participants will enjoy their creations. You can have your cake and eat it, too! 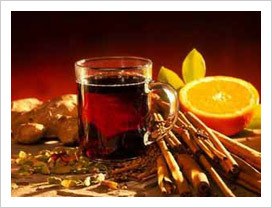 In this Sangria Challenge teams are challenged to make a very special alcoholic or non-alcoholic drink that includes White and Red Wine and lots of other "secret" ingredients. Teams will be instructed in the basics of wine and Sangria before the culinary portion. Teams will be challenged to a trivia quiz to see how much information they have retained—and also to allow the winning teams to have an advantage of picking their ingredients first (the challenge portion). This TeamBuilding Unlimited Sangria Challenge will tantalize your taste buds while challenging your knowledge and creativity. In addition to mixing lemons and lots of other fruits with wine and bubbly water and other "secret" ingredients, each team will develop a marketing plan for their drink, a new logo and slogan, a name for "their" winery and their specific sangria drink and so much more! Our knowledgeable facilitator will educate the group on wine, as well as the history of Sangria. "Chef Bon Vivant" provides interaction, facilitates humor and dispenses great cooking tips while your guests prepare a meal. Add pizzazz and laughter to your cooking event. Chef Bon Vivant partners with Cooking Schools, Caterers and Home Chefs! TeamBuilding Unlimited guides you through the world of olive oil—as participants taste and dip. Our Olive Oil Tasting is designed to refine the palate in terms of great, artisan-made olive oil. Participants learn about the history and culture of olive oil while tasting one of the essential building blocks of western cuisine. 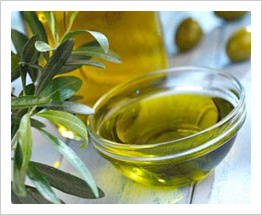 Participants will taste Olive Oil from Italy, France, Greece, Spain and California. Each region produces oils with different character and appeal based on the differences in climate, soil, variety of olive and processing method. Participants will experience these different oils with different flavor profiles. Is the bouquet floral like honey or lime blossom, fruity like mango or green apple, vegetal like artichoke or fennel, or spicy like pepper or dark chocolate? This Olive Oil Tasting is like a wine tasting... sip, swirl, smell—dip—and taste! 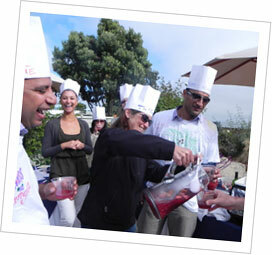 TeamBuilding Unlimited provides Foodie Facilitator, tasting sheets, sourdough bread, Olive oils, surprises, prizes and more. Teams compete to create the Best Chili Ever! Each team is given rules, ingredients, hotplate, pot, knives and other materials that they will use in order to develop a great recipe and final pot of Chili. Not all team members are "cooks." Team members select from a variety of different roles and responsibilities, but each team has the same amount of time. The "Chefs" are given the basic ingredients needed to make a great tasting pot of chili. Chefs experiment on flavor and ingredients, recording their mistakes and successes. While the Chili is cooking, other team members create a marketing campaign to promote their gastronomic creations, chef's hats with logos, sales pitch and Chili Chant. Judges, chosen from "within the ranks," make the final determination as to whose "Bowl of Red" is the BEST. There are several different criteria for best Chili. Flavor is just one component. Prizes will be awarded for Chili Chant, oral or visual presentation and more. Debriefing on goals and objectives, communication and more, if desired. And, at the end, all teams get to taste as much chili as they'd like. This fun interactive and delicious activity capitalizes on your team's creativity and sweet tooth. This is a great event to do before or after a meal and can be incorporated into your lunch, dinner or afternoon teambuilding treat. THE CUPCAKE CHALLENGE! Each team will be given paper to start, so they can create a Team Chef's Hat! Individuals decorate their chef's hat with their team name and anything else they feel is appropriate... or not. Then the real fun begins. Teams are challenged to Decorate their Cupcakes so that they symbolize the team itself, the company, the theme of the meeting, their positions at the company, or another theme. In addition each team will be given materials to create a "DISPLAY" in which they'll be able to stack their treats into showpieces. Prizes will be given to best overall display! Each team will be given Cupcakes that can be decorated or left as is. With a variety of cupcake design supplies, tools and assorted decorating materials, the group will turn their concept into reality. After the cupcakes are designed, decorated and displayed, each team will create a "commercial" to present their cupcakes to the entire group. And last but not least, participants will enjoy their creations. Murder on the Menu partners with a local long-established San Francisco Bay Area Professional Kitchen & Catering company to bring our clients a customized interactive murder mystery event, set in a state of the art industrial kitchen, your guests are the chefs and the mystery unfolds as you cook and dine. Our Murder on the Menu crew of improv actors will add to the drama. What could be better? You get to cook great food, eat well... and solve the mysteries that unfold one clue at a time. It's a recipe for success! 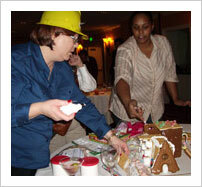 Teams work together to design, build and decorate the best Gingerbread House to reflect their company and/or their group within the company. All materials are provided including instructions, gingerbread, decorations, icing, candy, sprinkles and other goodies! You supply the resourceful creativity and dynamic energy. So roll up your sleeves and get down to food basics. Design a delicious gingerbread house that reflects the raison d'être of your group. What could be more tempting than building a structure completely from chocolate? In this case, chocolate and chocolate related foods. 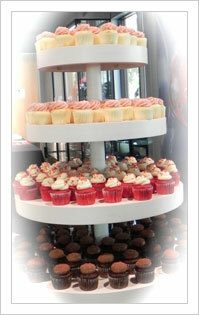 TeamBuilding has never been so Sweet! Group will be divided into teams and provided with all kinds of chocolate based foods that might include chocolate-covered graham crackers, M&Ms, chocolate Gummy Bears, Hershey bars and anything you can think of that is made of chocolate. We go for different shapes, sizes, and textures. Teams then compete to build a structure. One HMO firm had its teams build their ideal medical center. Another group set its teams to designing resorts. The result has to stand up on its own and, except for the white cardboard base, has to be completely edible. Teams are given time to design and build, and then they have to present the results. Half the fun is explaining why they built what they built and how they built it. 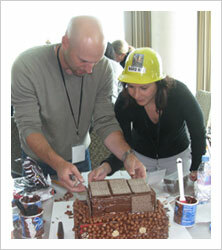 Read What Meetings Industry Megasite wrote about the Chocolate Challenge. A tasting tour through the dynamic and turbulent history of Chocolate along with instruction on how to enjoy and appreciate high-end chocolates. Tastings range from 41% through 90% cacao. Our Chocolatier guides you through a tasty sensation tour of the world of cacao from the bean to the bar. History, geography, culture and myths are explored. Use all of your senses as you discover and discuss this magical botanical wonderland of flavors, tastes, smells, touch and sights. 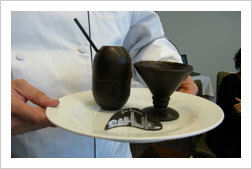 The Ultimate Chocolate Tasting is a fun and entertaining experience. Team Building Unlimited will provide a variety of high-quality chocolate products to reach all of your senses and make this interactive event entertaining and memorable. Like a wine tasting... only better. It's all about Chocolate! Dying for Chocolate? Want more insights into chocolate, chocolate news, recipes, and chocolate health? 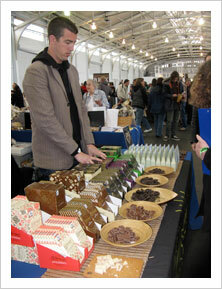 Check out Janet Rudolph's Chocolate Blog: Dying for Chocolate.